Lightweight foams and space-age rubber compounds are radically changing the feel of running. Reebok is using a Pebax-based foam, which is far lighter than the standard EVA that’s been used in running shoes for decades; but it also delivers excellent cushioning and off-the-charts bounce. That foam is Reebok’s answer to adidas’ Boost midsole. Since Boost was launched in 2013, every shoemaker has been working on its own version for delivering ‘high energy return’ (technically, the foam reduces the amount of energy you lose with each step). The Pebax that makes up Reebok’s version, Floatride, has more commonly been used as a hard but flexible plastic component – think the Wave plate in Mizuno shoes. Pebax is lighter, more flexible and more impact-resistant than other plastics, and when it’s blown into a foam, those properties remain, meaning the material compresses more and rebounds with more force than typical midsole foams. What it means for runners is a fun (and fast) shoe. We first experienced this foam in the Reebok Floatride Run, a training shoe that had a magical ability to turn easy jogs into tempo runs. 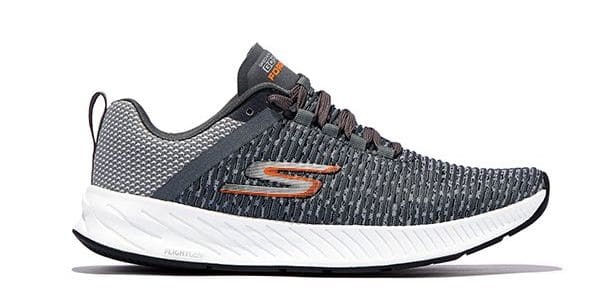 We quickly realised Reebok was onto something special with this foam, and it has continued to improve on the formula with the Floatride Flexweave. But thanks to that foam, it’s also a shoe that remains comfortable if you want to rock it at a more leisurely pace. This is the shoe for long-haul durability. The Forza 3 features a full-length rubber outsole and an updated post, giving runners plenty of stability for a lightweight shoe. Our wear-testers specifically pointed out how well this shoe held up over longer distances, up to a half marathon (which is not the case for all lightweight shoes), and on a variety of terrains. The latest Forza is about 28 grams lighter thanks to a new midsole foam, which our wear-testers felt provided better overall cushioning. The Beacon is light and fast, yet soft enough for high mileage. One tester wore it for both long runs of 40km-plus and 400m speedwork, and was impressed in each scenario. Assessments like that bring to mind the original Hoka One One Clifton, which was astonishingly light and fast for the amount of cushioning it offered. It’s easy to see why the comparison is made, given the thick foam sole. 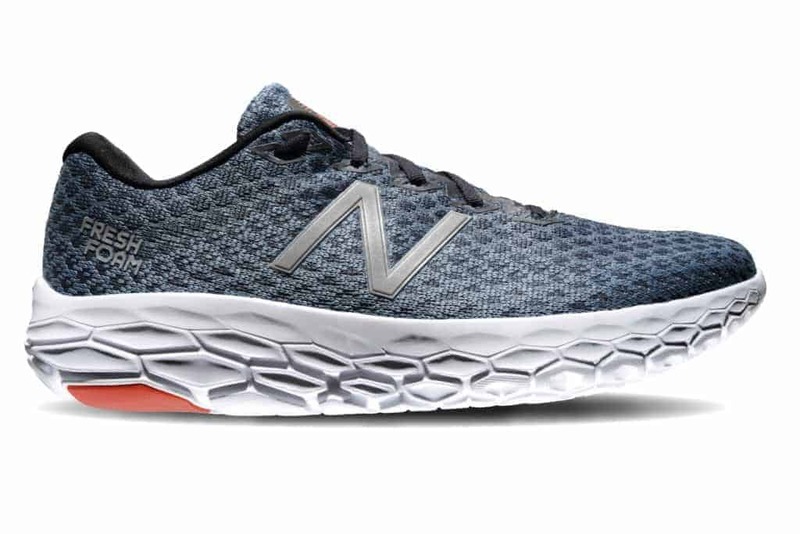 New Balance used a durable midsole compound called Fresh Foam Ground Contact, which can withstand road abrasions. By exposing this to the pavement, New Balance could eliminate a lot of rubber that would otherwise be needed for durability. The Wave Rider has long been Mizuno’s go-to, do-it-all shoe that serves runners well on everything from long runs to up-tempo workouts. A lot of that stems from the responsive feeling a Mizuno shoe typically delivers. Some might say such shoes feel firm; either way, when you want to go fast, this shoe allows you to roll. Long-time Rider wearers will instantly recognise the fit and the smooth underfoot sensation. (One tester said this shoe is like having a beer with an old friend.) But like version 21, this Rider is a whole lot softer than past versions – especially in the heel. 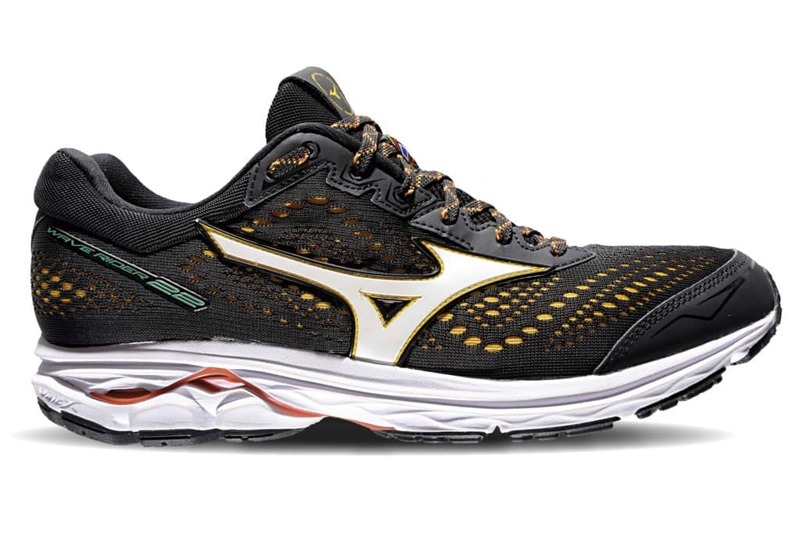 To achieve this level of cushioning Mizuno uses two different foams in the Rider’s midsole, with the softest one under the heel, closest to the road, to smooth your landing on the pavement. The firmer layer, closer to the foot, is also noticeably soft but feels speedy, too. Mizuno has also stuck with the Wave plate. It delivers a rigid underfoot feel, say our testers, but helps provide extra snap and leads to faster turnover at quicker speeds. The biggest difference is the full-length engineered-mesh upper. The single piece of mesh reduces excess stitching to reduce the risk of irritation and improve fit. Plus it delivers the kind of support for which you’d otherwise need overlays. While the fit is exceptional, with a roomy toebox praised by our female testers, we found the fabric to be hot during our summer testing period. With the extra softness comes some extra heft. The shoe has an extraordinarily thick heel, nearly on par with what you’ll find in shoes from Hoka One One. Even so, testers weren’t bothered by it, saying the shoe resisted feeling clunky. Directly under the heel is Mizuno’s U4icX compound, a super-soft layer that reduces impact when you strike heel first. The rest of the midsole is comprised of U4ic, a slightly firmer but still soft performance foam.